Creates a new renderer with no tool tip generator and no URL generator. Constructs a new renderer with the specified '3D effect'. Calculates the bar width and stores it in the renderer state. Deprecated. As of 1.0.13, use createStackedValueList( CategoryDataset, Comparable, int, double, boolean). Returns a list containing the stacked values for the specified series in the given dataset, plus the supplied base value. Draws the visual representation of one data item from the chart (in fact, this method does nothing until it reaches the last item for each category, at which point it draws all the items for that category). 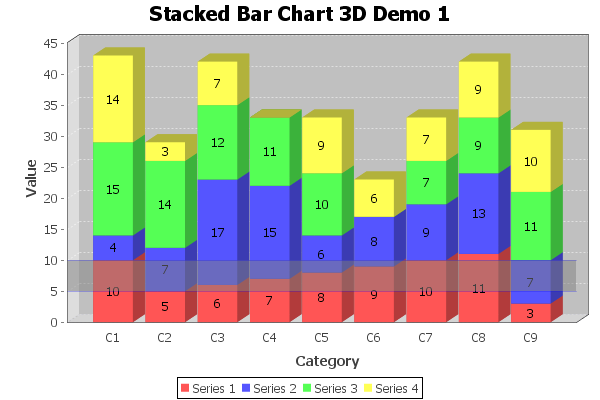 Draws a stack of bars for one category, with a horizontal orientation. Draws a stack of bars for one category, with a vertical orientation. The defaults (no tool tip or URL generators) have been chosen to minimise the processing required to generate a default chart. If you require tool tips or URLs, then you can easily add the required generators. xOffset - the x-offset for the 3D effect. yOffset - the y-offset for the 3D effect. renderAsPercentages - a flag that controls whether the data values are rendered as percentages. The range (or null if the dataset is empty). rendererIndex - the renderer index. category - the category key (null not permitted). base - the base value. asPercentages - a flag that controls whether the values in the list are converted to percentages of the total. includedRows - the included rows. dataArea - the plot area. domainAxis - the domain (category) axis. rangeAxis - the range (value) axis. values - the value list. dataArea - the data area (adjusted for the 3D effect).